Download "Working harder and smarter > Comprehensive coverage > 165 600 (123 447) 420 1850 (569 2508) 14,000 unlimited (6,350 unlimited)"
2 ENGINE hp (kw) TO R Q U E l b - f t ( N m ) ( ) GVW ( ) lbs (kg) 14,000 unlimited (6,350 unlimited) Your trucks and drivers work hard in tough conditions, day in, day out. Their performance and productivity rise to a whole new level when you spec Allison Rugged Duty Series fully automatic transmissions. Working harder and smarter > Allison fully automatic transmissions fit operating requirements better than other transmissions because they ve been engineered specifically for the way you work. They utilize Allison s patented Continuous Power Technology to deliver smooth, seamless, full-power shifts, superior acceleration and startability. And Allison Automatics use engine power more efficiently, which equates to less fuel consumed. On pavement, full-power shifts mean shorter trip times. In traffic, there s no relentless shifting, as with manuals. No unpredictable and delayed shifting, as with automated manuals. And neither can compare to Allison s vehicle control on a grade. Off-road, Allison Automatics provide smooth, effortless shifting and precise traction control. While manuals and automated manuals cause the drive wheels to hop and do damage to the drivetrain, Allison Automatics achieve just the right amount of traction for load and ground conditions dirt, mud, sand or gravel. They can take whatever you throw at them and still deliver RDS, 1350 RDS, 2100 RDS, 2200 RDS, 2300 RDS, 2350 RDS, 2500 RDS, 2550 RDS 3000 RDS, 3500 RDS 4000 RDS, 4500 RDS, 4700 RDS Proven reliability and durability > Allison Transmission has built a reputation on our ability to build transmissions that last. 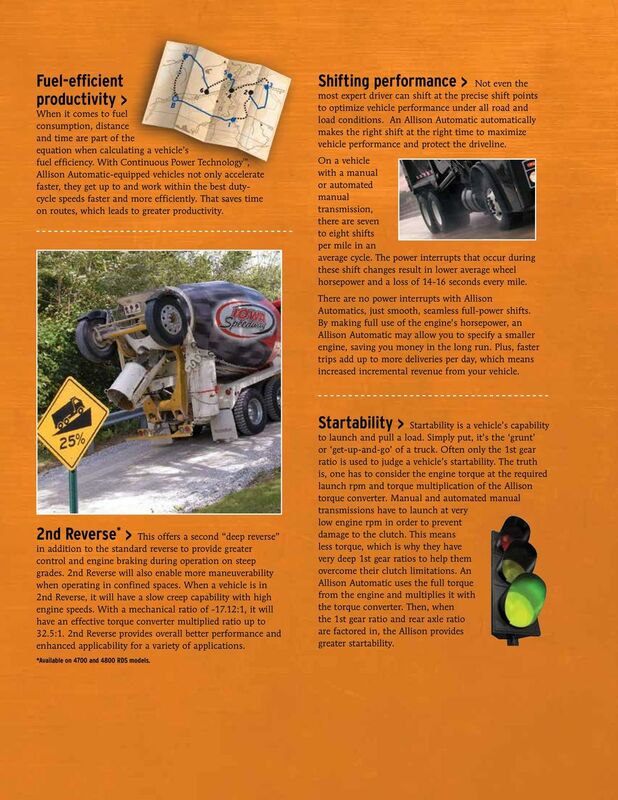 That is why Allison Automatics are the preferred choice for on-/off-highway, rugged duty applications. RE LIA BI LIT DU Y RA BI LIT Y Comprehensive coverage > All Allison automatic transmission models offer comprehensive coverage with 100% parts and labor. Coverage may vary by model and by application. Contact your Allison representative for details. 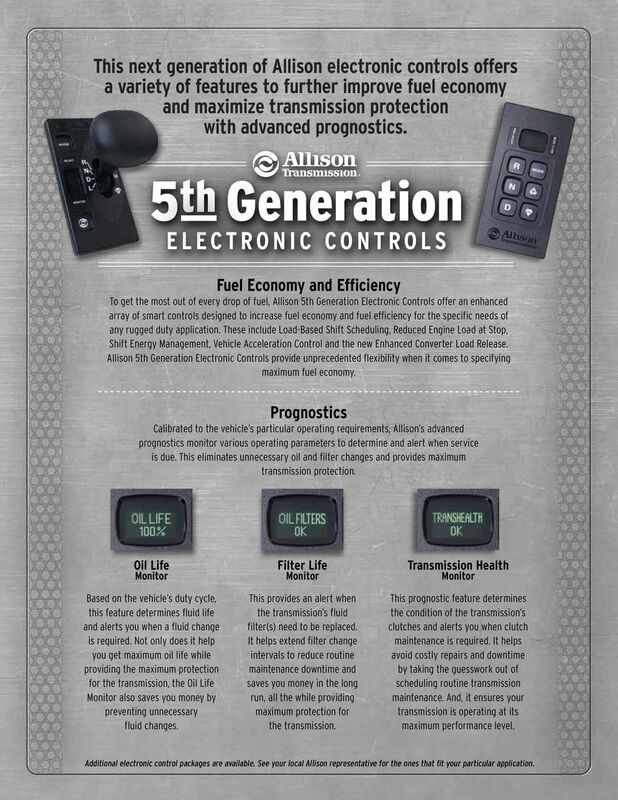 3 This next generation of Allison electronic controls offers a variety of features to further improve fuel economy and maximize transmission protection with advanced prognostics. 5th Generation ELECTRONIC CONTROLS Fuel Economy and Efficiency To get the most out of every drop of fuel, Allison 5th Generation Electronic Controls offer an enhanced array of smart controls designed to increase fuel economy and fuel efficiency for the specific needs of any rugged duty application. These include Load-Based Shift Scheduling, Reduced Engine Load at Stop, Shift Energy Management, Vehicle Acceleration Control and the new Enhanced Converter Load Release. Allison 5th Generation Electronic Controls provide unprecedented flexibility when it comes to specifying maximum fuel economy. Prognostics Calibrated to the vehicle s particular operating requirements, Allison s advanced prognostics monitor various operating parameters to determine and alert when service is due. This eliminates unnecessary oil and filter changes and provides maximum transmission protection. Oil Life Monitor Based on the vehicle s duty cycle, this feature determines fluid life and alerts you when a fluid change is required. Not only does it help you get maximum oil life while providing the maximum protection for the transmission, the Oil Life Monitor also saves you money by preventing unnecessary fluid changes. Filter Life Monitor This provides an alert when the transmission s fluid filter(s) need to be replaced. It helps extend filter change intervals to reduce routine maintenance downtime and saves you money in the long run, all the while providing maximum protection for the transmission. Transmission Health Monitor This prognostic feature determines the condition of the transmission s clutches and alerts you when clutch maintenance is required. 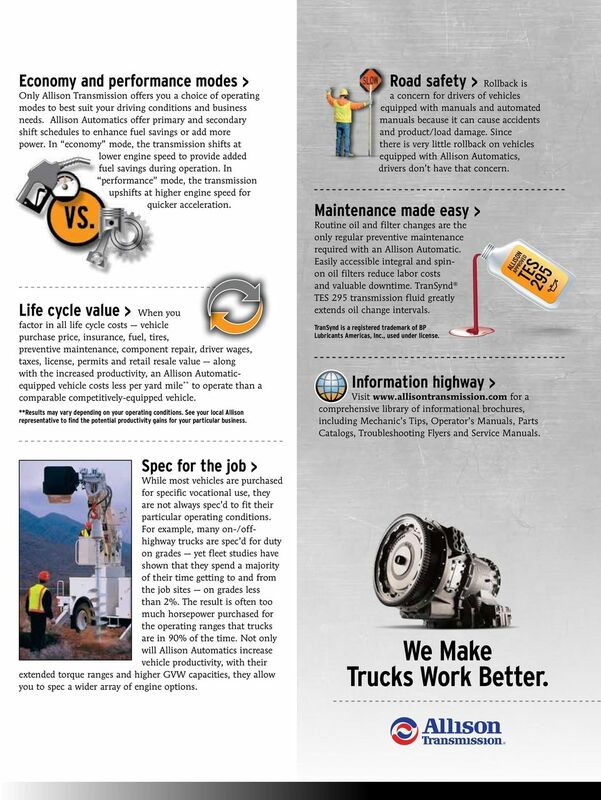 It helps avoid costly repairs and downtime by taking the guesswork out of scheduling routine transmission maintenance. And, it ensures your transmission is operating at its maximum performance level. Additional electronic control packages are available. See your local Allison representative for the ones that fit your particular application. 4 Fuel-efficient productivity > When it comes to fuel consumption, distance and time are part of the equation when calculating a vehicle s fuel efficiency. With Continuous Power Technology, Allison Automatic-equipped vehicles not only accelerate faster, they get up to and work within the best dutycycle speeds faster and more efficiently. That saves time on routes, which leads to greater productivity. Shifting performance > Not even the most expert driver can shift at the precise shift points to optimize vehicle performance under all road and load conditions. An Allison Automatic automatically makes the right shift at the right time to maximize vehicle performance and protect the driveline. On a vehicle with a manual or automated manual transmission, there are seven to eight shifts per mile in an average cycle. The power interrupts that occur during these shift changes result in lower average wheel horsepower and a loss of seconds every mile. There are no power interrupts with Allison Automatics, just smooth, seamless full-power shifts. By making full use of the engine s horsepower, an Allison Automatic may allow you to specify a smaller engine, saving you money in the long run. Plus, faster trips add up to more deliveries per day, which means increased incremental revenue from your vehicle. 2nd Reverse * > This offers a second deep reverse in addition to the standard reverse to provide greater control and engine braking during operation on steep grades. 2nd Reverse will also enable more maneuverability when operating in confined spaces. When a vehicle is in 2nd Reverse, it will have a slow creep capability with high engine speeds. With a mechanical ratio of :1, it will have an effective torque converter multiplied ratio up to 32.5:1. 2nd Reverse provides overall better performance and enhanced applicability for a variety of applications. *Available on 4700 and 4800 RDS models. Startability > Startability is a vehicle s capability to launch and pull a load. Simply put, it s the grunt or get-up-and-go of a truck. Often only the 1st gear ratio is used to judge a vehicle s startability. The truth is, one has to consider the engine torque at the required launch rpm and torque multiplication of the Allison torque converter. Manual and automated manual transmissions have to launch at very low engine rpm in order to prevent damage to the clutch. This means less torque, which is why they have very deep 1st gear ratios to help them overcome their clutch limitations. An Allison Automatic uses the full torque from the engine and multiplies it with the torque converter. Then, when the 1st gear ratio and rear axle ratio are factored in, the Allison provides greater startability. 5 Economy and performance modes > Only Allison Transmission offers you a choice of operating modes to best suit your driving conditions and business needs. 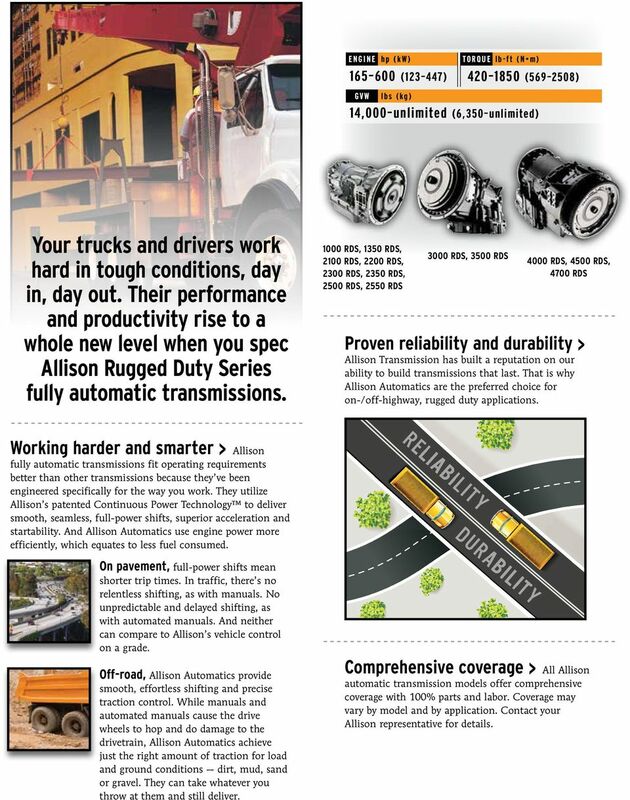 Allison Automatics offer primary and secondary shift schedules to enhance fuel savings or add more power. In economy mode, the transmission shifts at lower engine speed to provide added fuel savings during operation. In performance mode, the transmission upshifts at higher engine speed for quicker acceleration. Life cycle value > When you factor in all life cycle costs vehicle purchase price, insurance, fuel, tires, preventive maintenance, component repair, driver wages, taxes, license, permits and retail resale value along with the increased productivity, an Allison Automaticequipped vehicle costs less per yard mile ** to operate than a comparable competitively-equipped vehicle. **Results may vary depending on your operating conditions. 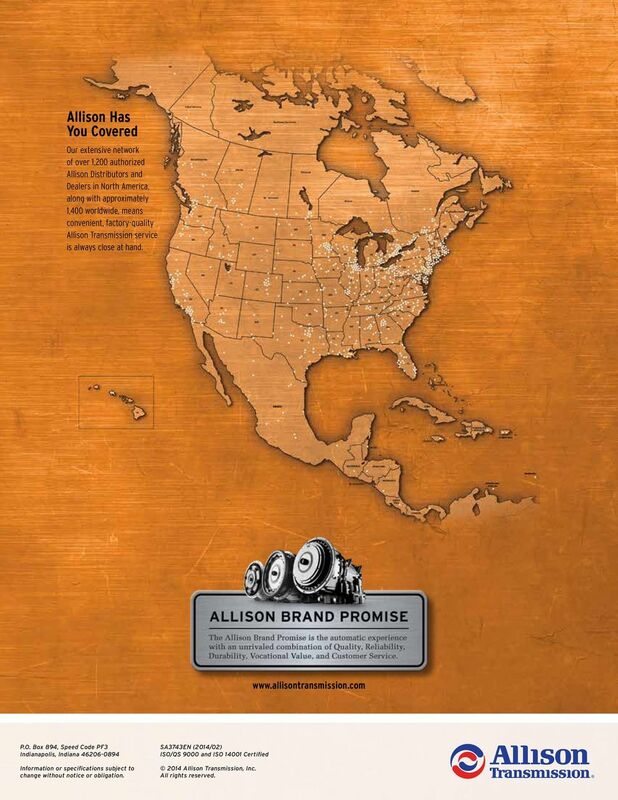 See your local Allison representative to find the potential productivity gains for your particular business. Spec for the job > While most vehicles are purchased for specific vocational use, they are not always spec d to fit their particular operating conditions. For example, many on-/offhighway trucks are spec d for duty on grades yet fleet studies have shown that they spend a majority of their time getting to and from the job sites on grades less than 2%. The result is often too much horsepower purchased for the operating ranges that trucks are in 90% of the time. Not only will Allison Automatics increase vehicle productivity, with their extended torque ranges and higher GVW capacities, they allow you to spec a wider array of engine options. Road safety > Rollback is a concern for drivers of vehicles equipped with manuals and automated manuals because it can cause accidents and product/load damage. Since there is very little rollback on vehicles equipped with Allison Automatics, drivers don t have that concern. Maintenance made easy > Routine oil and filter changes are the only regular preventive maintenance required with an Allison Automatic. Easily accessible integral and spinon oil filters reduce labor costs and valuable downtime. TranSynd TES 295 transmission fluid greatly extends oil change intervals. TranSynd is a registered trademark of BP Lubricants Americas, Inc., used under license. 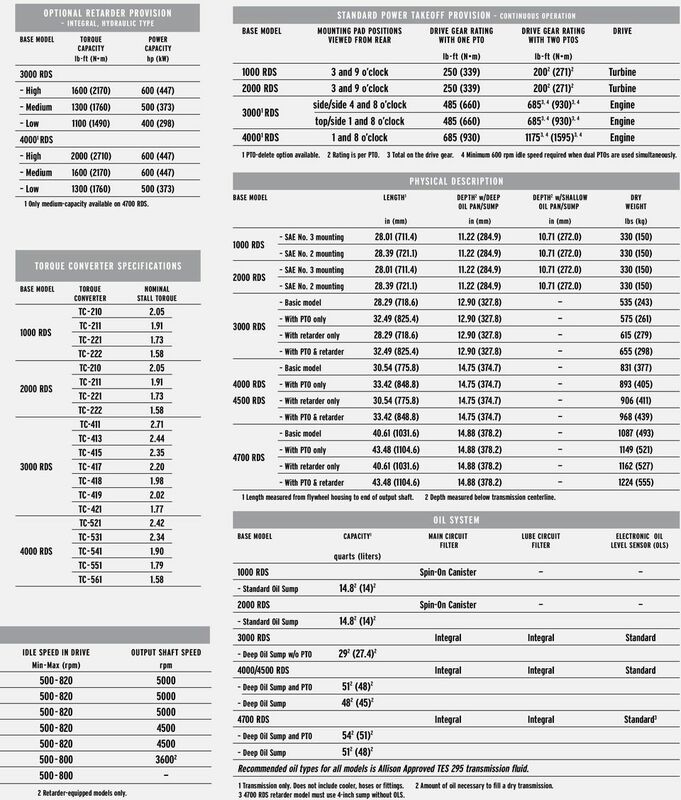 TES 295 ALLISON Information highway > Visit for a comprehensive library of informational brochures, including Mechanic s Tips, Operator s Manuals, Parts Catalogs, Troubleshooting Flyers and Service Manuals. APPROVED We Make Trucks Work Better. 6 Ratings and Specifications RATINGS MODEL RATIO PARK MAX INPUT MAX INPUT MAX INPUT TORQUE w/sem MAX TURBINE MAX GVW MAX GCW PAWL POWER 1 TORQUE 1 OR TORQUE LIMITING 1,2 TORQUE 3 hp (kw) lb-ft (N m) lb-ft (N m) lb-ft (N m) lbs (kg) lbs (kg) 1000 RDS Close Ratio Yes 340 4,7 (254) 4,7 575 (780) 660 4,7 (895) 4, (1288) 4 19,500 (8,845) 26,001 (11,800) 1350 RDS Close Ratio Yes 340 4,7 (254) 4,7 575 (780) 660 4,7 (895) 4, (1288) 4 19,500 (8,845) 30,000 (13,600) 2100 RDS Close Ratio No 340 4,7 (254) 4,7 575 (780) 660 4,7 (895) 4, (1288) 4 26,000 (11,800) 26,000 (11,800) 2200 RDS Close Ratio Yes 340 4,7 (254) 4,7 575 (780) 660 4,7 (895) 4, (1288) 4 26,000 (11,800) 26,001 (11,800) 2300 RDS 5 Close Ratio No 365 (242) n/a 510 (610) (1288) 4 33,000 (15,000) 33,000 (15,000) 2350 RDS 7 Close Ratio Yes (254) (780) (895) (1288) 4 30,000 (13,600) 30,000 (13,600) 2500 RDS On-/Off- Highway Wide Ratio No 340 4,7 (254) 4,7 575 (780) 660 4,7 (895) 4, (1288) 4 33,000 (15,000) 33,000 (15,000) Refuse Wide Ratio No 300 (224) 550 (746) 565 (766) (1288) 4 24,200 (11,000) 24,200 (11,000) 2550 RDS 7 Wide Ratio Yes (254) (780) (895) (1288) 4 30,000 (13,600) 30,000 (13,600) 3000 RDS On-/Off- Highway Close Ratio n/a 370 (276) 1100 (1491) ,7 (1695) 6, (2169) 80,000 (36,288) 80,000 (36,288) Mixer Close Ratio n/a 370 (276) 1100 (1491) ,7 (1695) 6, (2169) 62,000 (28,123) Refuse Close Ratio n/a 370 (276) 1100 (1491) ,7 (1695) 6, (2169) 62,000 (28,123) Specialty PTO, HET Close Ratio n/a 370 (276) (1695) 7 n/a 1700 (2305) 3500 RDS On-/Off- Highway Wide Ratio n/a 330 (246) 860 (1166) (1424) (1966) 4 80,000 (36,288) 80,000 (36,288) Mixer/Refuse Wide Ratio n/a 330 (246) 860 (1166) n/a 1420 (1925) 60,000 (27,216) Specialty PTO Wide Ratio n/a 330 (246) 950 (1288) (1424) (1966) HET Wide Ratio n/a 330 (246) 985 (1335) (1424) (1966) 4000 RDS On-/Off- Highway Close Ratio n/a (421) (2400) (2508) (3525) Refuse Close Ratio n/a 500 (373) 1550 (2102) n/a 2450 (3322) Specialty PTO Close Ratio n/a 565 (421) 1770 (2400) n/a 2600 (3525) HET Close Ratio n/a 600 (447) 1850 (2508) n/a 2600 (3525) 4500 RDS On-/Off- Highway Wide Ratio n/a (421) (2237) (2508) (3322) Refuse Wide Ratio n/a 500 (373) 1550 (2102) n/a 2450 (3322) Specialty PTO Wide Ratio n/a (421) (2237) (2400) (3525) HET Wide Ratio n/a (447) (2237) (2508) (3525) 4700 RDS On-/Off- Highway Widest Ratio n/a (421) (2400) (2508) (3525) Refuse Widest Ratio n/a 500 (373) 1550 (2102) n/a 2450 (3322) HET Widest Ratio n/a 600 (447) 1850 (2508) n/a 2600 (3525) 1 Gross ratings as defined by ISO 1585 or SAE J SEM = engine controls with Shift Energy Management. 3 Turbine torque limit based on iscaan standard deductions. 4 SEM and torque limiting are required to obtain this rating. 5 Only available for VORTEC 8-1L gasoline powered engine applications. 6 Requires Allison Transmission engine-transmission combination approval. Only available in gears three through six. 7 Check with your OEM to ensure offerings. 8 Available in gears two through six. 9 Only available in gears four through seven. 10 Only available in gears three through six. 11 With and without torque limiting. GEAR RATIOS TORQUE CONVERTER MULTIPLICATION NOT INCLUDED MODEL FIRST SECOND THIRD FOURTH FIFTH SIXTH SEVENTH REVERSE 2ND REVERSE 1000/1350/2100/ 2200/2300/2350 RDS 3.10:1 1.81:1 1.41:1 1.00:1 0.71:1 0.61: :1 2500/2550 RDS 3.51:1 1.90:1 1.44:1 1.00:1 0.74:1 0.64: : RDS 3.49:1 1.86:1 1.41:1 1.00:1 0.75:1 0.65:1-5.03: RDS 4.59:1 2.25:1 1.54:1 1.00:1 0.75:1 0.65:1-5.00: RDS 3.51:1 1.91:1 1.43:1 1.00:1 0.74:1 0.64:1-4.80: RDS 4.70:1 2.21:1 1.53:1 1.00:1 0.76:1 0.67:1-5.55: RDS 7.63:1* 3.51:1 1.91:1 1.43:1 1.00:1 0.74:1 0.64:1-4.80: :1 2 * Manually selected first gear. 1 Check with your OEM to ensure offerings. 2 SEM/LRTP or LRTP Only is required. MODEL ENGINE SPEEDS FULL LOAD GOVERNED SPEED Min-Max (rpm) 1000/1350 RDS /2200/2300 RDS RDS RDS RDS /3500 RDS /4500/4700 RDS Engines with full-load governed speed greater than 3800 rpm require Application Engineering review. 7 OPTIONAL RETARDER PROVISION INTEGRAL, HYDRAULIC TYPE BASE MODEL TORQUE POWER CAPACITY CAPACITY lb-ft (N m) hp (kw) 3000 RDS High 1600 (2170) 600 (447) Medium 1300 (1760) 500 (373) Low 1100 (1490) 400 (298) RDS High 2000 (2710) 600 (447) Medium 1600 (2170) 600 (447) Low 1300 (1760) 500 (373) 1 Only medium-capacity available on 4700 RDS. 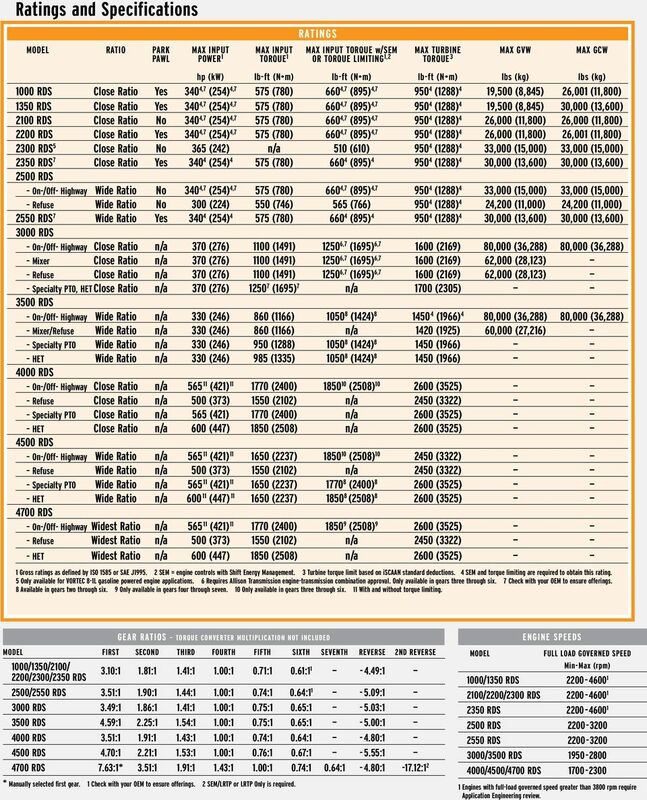 TORQUE CONVERTER SPECIFICATIONS BASE MODEL TORQUE NOMINAL CONVERTER STALL TORQUE TC RDS TC TC TC TC RDS TC TC TC TC TC TC RDS TC TC TC TC TC TC RDS TC TC TC IDLE SPEED IN DRIVE OUTPUT SHAFT SPEED Min-Max (rpm) rpm Retarder-equipped models only. STANDARD POWER TAKEOFF PROVISION CONTINUOUS OPERATION BASE MODEL MOUNTING PAD POSITIONS DRIVE GEAR RATING DRIVE GEAR RATING DRIVE VIEWED FROM REAR WITH ONE PTO WITH TWO PTOS lb-ft (N m) lb-ft (N m) 1000 RDS 3 and 9 o clock 250 (339) (271) 2 Turbine 2000 RDS 3 and 9 o clock 250 (339) (271) 2 Turbine RDS side/side 4 and 8 o clock 485 (660) 685 3, 4 (930) 3, 4 Engine top/side 1 and 8 o clock 485 (660) 685 3, 4 (930) 3, 4 Engine RDS 1 and 8 o clock 685 (930) , 4 (1595) 3, 4 Engine 1 PTO-delete option available. 2 Rating is per PTO. 3 Total on the drive gear. 4 Minimum 600 rpm idle speed required when dual PTOs are used simultaneously. PHYSICAL DESCRIPTION BASE MODEL LENGTH 1 DEPTH 2 w/deep DEPTH 2 w/shallow DRY OIL PAN/SUMP OIL PAN/SUMP WEIGHT 1000 RDS 2000 RDS 3000 RDS in (mm) in (mm) in (mm) lbs (kg) SAE No. 3 mounting (711.4) (284.9) (272.0) 330 (150) SAE No. 2 mounting (721.1) (284.9) (272.0) 330 (150) SAE No. 3 mounting (711.4) (284.9) (272.0) 330 (150) SAE No. 2 mounting (721.1) (284.9) (272.0) 330 (150) Basic model (718.6) (327.8) 535 (243) With PTO only (825.4) (327.8) 575 (261) With retarder only (718.6) (327.8) 615 (279) With PTO & retarder (825.4) (327.8) 655 (298) Basic model (775.8) (374.7) 831 (377) 4000 RDS With PTO only (848.8) (374.7) 893 (405) 4500 RDS With retarder only (775.8) (374.7) 906 (411) 4700 RDS With PTO & retarder (848.8) (374.7) 968 (439) Basic model (1031.6) (378.2) 1087 (493) With PTO only (1104.6) (378.2) 1149 (521) With retarder only (1031.6) (378.2) 1162 (527) With PTO & retarder (1104.6) (378.2) 1224 (555) 1 Length measured from flywheel housing to end of output shaft. 2 Depth measured below transmission centerline. OIL SYSTEM BASE MODEL CAPACITY 1 MAIN CIRCUIT LUBE CIRCUIT ELECTRONIC OIL FILTER FILTER LEVEL SENSOR (OLS) quarts (liters) 1000 RDS Spin-On Canister Standard Oil Sump (14) RDS Spin-On Canister Standard Oil Sump (14) RDS Integral Integral Standard Deep Oil Sump w/o PTO 29 2 (27.4) /4500 RDS Integral Integral Standard Deep Oil Sump and PTO 51 2 (48) 2 Deep Oil Sump 48 2 (45) RDS Integral Integral Standard 3 Deep Oil Sump and PTO 54 2 (51) 2 Deep Oil Sump 51 2 (48) 2 Recommended oil types for all models is Allison Approved TES 295 transmission fluid. 1 Transmission only. Does not include cooler, hoses or fittings. 2 Amount of oil necessary to fill a dry transmission RDS retarder model must use 4-inch sump without OLS. 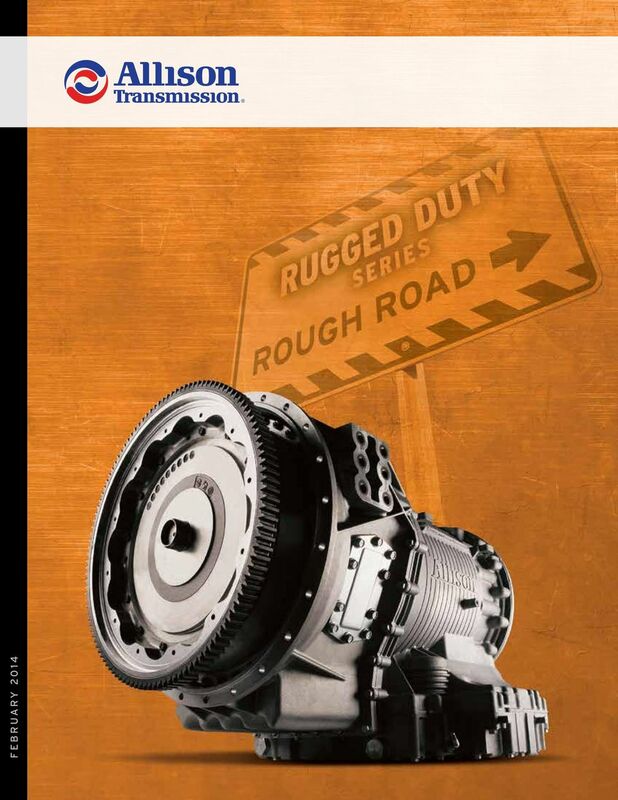 8 Allison Has You Covered Our extensive network of over 1,200 authorized Allison Distributors and Dealers in North America, along with approximately 1,400 worldwide, means convenient, factory-quality Allison Transmission service is always close at hand. P.O. Box 894, Speed Code PF3 Indianapolis, Indiana Information or specifications subject to change without notice or obligation. SA3743EN (2014/02) ISO/QS 9000 and ISO Certified 2014 Allison Transmission, Inc. All rights reserved. MAY 2014 Our core advantage > For more than 30 years in oil and gas fields all over the world, Allison Automatics have made drilling, setting pipe, hydraulic fracturing and cementing easier and more productive. ZF W325 Vertical offset, direct mount marine transmission. ZF W320 Vertical offset, direct mount marine transmission. If it s not Allison, it s not Automatic. ZF 350 A 7 Down angle, direct mount marine transmission. ZF 220 A 10 Down angle, direct mount marine transmission. ZF 286 A 7 Down angle, direct mount marine transmission. Spicer Heavy-Duty Tandem Drive Axles. Stronger and More Durable All Day. Every Day. KUBOTA DIESEL ZERO-TURN MOWER ZD21/ZD28. Turf Care Professionals can now enjoy the ultimate in zero-turn efficiency. Spicer Axles and Tire Pressure Management Systems Spicer Fire and Rescue Vehicle Products Spicer Axle, Driveshaft, and Tire Pressure Management Systems Bendix Foundation Brake Systems Everything You Need. With an excellent weight-to-power ratio of 37 kg/hp, the C-L model is ideal for general field work, as well as for PTO and transport applications. Innoauto specialise in a niche range of robust public transportation vehicles specially designed for rough road conditions. Selecting an air motor for your application Are you looking for a suitable motor for your construction? The following guide will help you to avoid annoying mistakes which could drive up running costs later.